This is book 2 in the wonderful Sophie Trace Trilogy. Sophie Trace is pretty much your average small town. This book focuses on Vanessa Jessup, police chief Brill Jessup's daughter. Vanessa returns home from college very pregnant, which sends shock waves through her family. The family deals with this unexpected news while the town's law enforcement is being hunted down by a madman. The plot of this book is fast moving, the characters very well written, and it is an overall great read. I really enjoy Kathy Herman's work, as she has the gift of creating characters you can relate to. I finished the novel quite quickly because I just has to know how things would end up. It's a great story of forgiveness, acceptance, and love. I give it two thumbs up and cannot wait for the third book! Check out the trailer below. 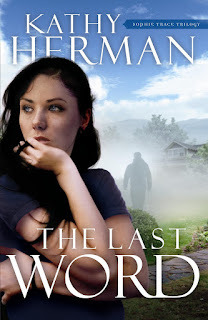 The Last Word, by Kathy Herman from David C. Cook on Vimeo. Heart-pounding suspense meets heart-challenging truth as best-selling author Kathy Herman returns to Sophie Trace in her new page-turner, The Last Word (David C Cook, October 2009). Based on Romans 1:16, “For I am not ashamed of the gospel, because it is the power of God for the salvation of everyone who believes: first for the Jew, then for the gentile,” Herman’s second installment in the Sophie Trace series triumphantly demonstrates God’s miraculous ability to heal the broken. This theme comes to life in Vanessa Jessup, a twenty-year-old college student who becomes pregnant while having a secret love affair with her psychology professor and has to make a choice: either end the pregnancy or end the relationship. The biblical truths she learned growing up prompt her to choose life and to go home to the refuge of her parents’ counsel and a right relationship with God. When Vanessa arrives home, her mother, Sophie Trace Police Chief Brill Jessup, is stunned to see that she’s pregnant—and by one of her professors. While Brill is glad her middle daughter rejected the father’s abortion ultimatum, she’s also hurt that Vanessa ignored her upbringing and angry that the professor has disappeared without as much as a nickel of child support. But that’s not all Brill’s got on her plate. One of her detectives has been killed, and the attacker has threatened to come for her next. When a second cop is wounded, public criticism mounts as Brill attempts to stay alive long enough to catch the perp. And she’s trying to find the deadbeat dad as Vanessa struggles to make decisions about her future. In spite of Brill’s best efforts to stay safe, the murderer finally kidnaps and threatens to kill her and then commit suicide. As her life hangs in the balance, Brill becomes concerned that her attacker is about to die and is not saved and refuses to be silenced in her witness of God’s love for him. In a show of grace under pressure and fierce determination, Brill will manage to have the last word, even if it kills her. Author Bio: Best-selling suspense novelist Kathy Herman has written fifteen novels, including CBA bestsellers The Real Enemy, Tested by Fire and All Things Hidden, since retiring from her family’s Christian bookstore business. Kathy and her husband, Paul, have three grown children and five grandchildren and live in Tyler, Texas.